Walter was two and a half years old and recovering from heartworm treatment when he came into Katie’s life back in 2011 as a rescued dog. Katie says Walter is a confident and calm dog who loves to hang out with all ages of people, listening to them talk and enjoying the pets he receives. 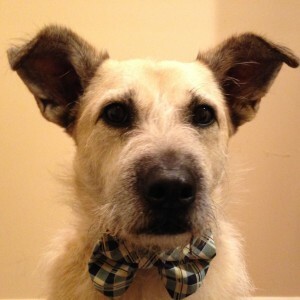 His breed origins are most likely Wheaten and Corgi, both affectionate and loyal terrier breeds. Katie and Walter visit as a North Star Therapy Animals team with families at Solid Ground in White Bear Lake where the children are able to sign up for reading sessions with Walter. The team also visits at Children’s Hospitals and Clinics of Minnesota in St. Paul, where Walter gets to interact with rehab patients under the guidance of amazing therapists. “When he realizes we are at a pet therapy location, he picks up his ears, puts a dapper jauntiness in his step, and looks for opportunities to greet people,” shares Katie. At home though, Walter stays busy chasing squirrels up trees, running and wrestling with his best dog friend Pippin, and is always available for a long walk. In the house he is always at Katie’s side, a behavior any Corgi owner will surely recognize!